[Sir Ernest Shackleton, Arctic explorer.] Offprint (with photographic plate) of article: 'Speeches at the unveiling of the Shackleton Memorial'. 'Reprinted from The Geographical Journal, vol. LXXIX no. 3, March 1932'. Printed by William Clowes and Sons, Limited, London and Eccles, England. pp, 8vo, paginated -167. Preceded by photographic plate of 'The Shackleton Memorial' (on the outside of the Royal Geographical Society, London), on art paper. Stitched into blue printed wraps. In good condition, lightly aged. Begins: 'At the invitation of the Memorial Committee the company assembled in the Hall of the Society at 3 p.m. On Saturday 9 January 1932. | The Most Honourable the MARQUESS OF ZETLAND, Chairman of the Memorial Committee, addressing the President of the Society, said: | […]'. Substantial typescript, apparently unpublished, of a 'Digest Gazetteer of Scottish Lochs & Rivers', with entries giving a mass of geographic information under 33 shires, and also including details of local hotels for each shire. With six photographs. Without place. [1920s.] Containing two photographs with the stamp of the Scotsman and Evening Dispatch, Edinburgh. 341pp., foolscap 8vo, typed onto rectos only, and with the main text paginated in blue pencil to 252pp. Six black and white illustrative photographs laid down, two with the stamp of 'The Scotsman' newspaper on the reverse. A substantial volume, bound with string and staples, with thumb index. In brown wraps, with typed label on front: 'DIGEST GAZETTEER | OF | SCOTTISH LOCHS & | RIVERS'. In good condition, on lightly-aged paper, in worn wraps. [ Tunisia Campaign, Second World War. ] Set of twenty-two printed coloured fold-out GSGS British Army maps of Tunisia, with index. With covering Autograph Note Signed from Vincent Jones to military historian Barrie Pitt. Twenty-one of the twenty-two maps are stapled into a buff card folder, bearing on the cover, in manuscript: Maj. V. S. Duncan-Jones. | Tunisia | 1/200,000'. 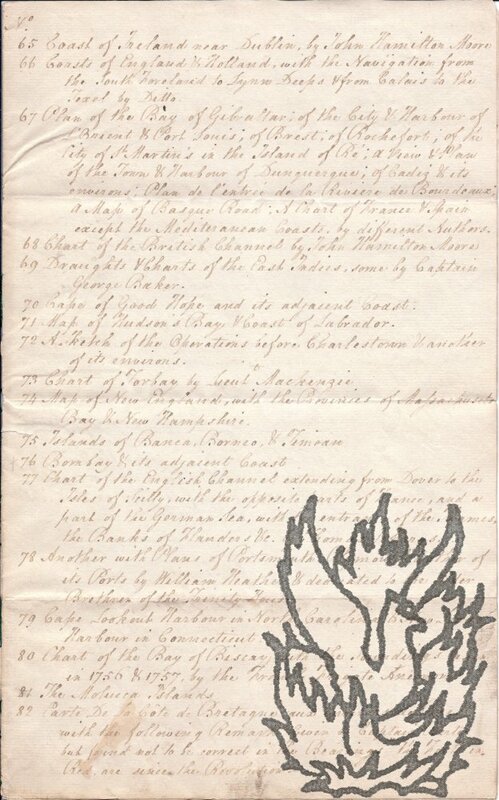 The twenty-second map loosely inserted, as is Jones's autograph letter to Pitt. In fair condition, with light signs of age and wear. The bound maps, all of which are in colour and all around 50 x 33 cm., are numbered in pencil 1 to 23, with 16 and 20 lacking. "Sir Clement Markham". Bifolium, 4to, india paper, fold marks, good condition, text on pp.-. Royal Medals for the Encouragement of Geopgraphical Sciewnce and Discovery were to be presented in the meeting, including the Founder's Medal to H.R.H. the Duke of the Abruzzi for his self-financed expedition othe North Pole. A resume of the expedition is given ("incapacitated by frost-bite [...] highest latitude yet attained by man", etc). The achievements of A, Donaldson Smith are given second billing (African exploration). Other medals listed. 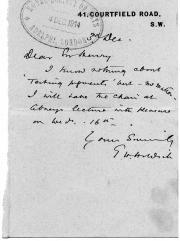 The Annual Dinner is announced on p..
[Sir John Hunt, mountaineer and soldier] Eight Typed Letters Signed and two Autograph Letters Signed to journalist, Arthur Bourne, with autograph letter from Lady Hunt, two letters from secretaries, Hunt's funeral service, copies of Bourne's replies. Six of Hunt's letters on House of Lords letterheads, three on letterhead of the Duke of Edinburgh's Award, and one on letterhead of the Royal Geographical Society, London; the ten dating from between 1962 and 1983. The collection contains 31 items and is in good condition, on lightly aged and worn paper. Hunt's eight typed letters (three signed 'John Hunt' and five signed 'John') total 4pp., 4to, and 4pp, 12mo; his two autograph letters (one 'John Hunt' and one 'John') total 3pp., 12mo. 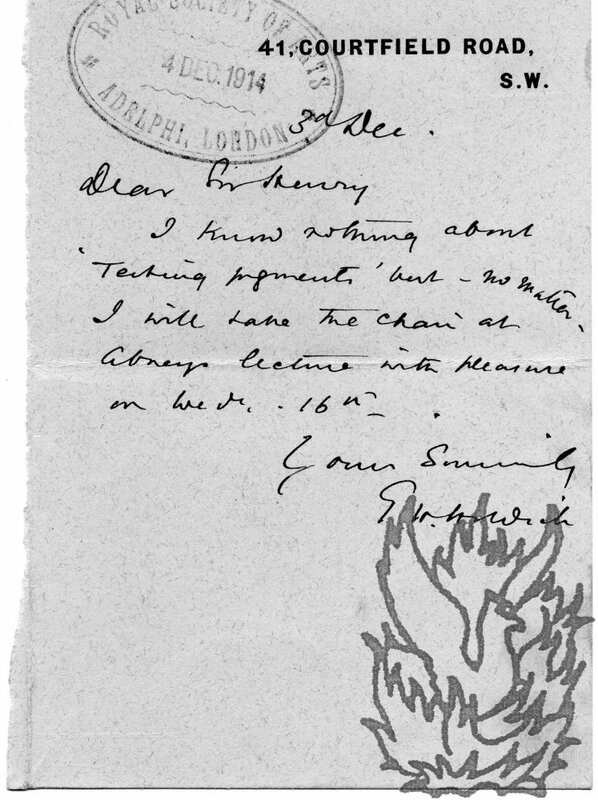 Autograph Letter Signed ('John') from John Carveth Wells [Grant Carveth Wells?] to 'Juan', on letterhead with caricatured portrait, thanking him for the loan of his 'Soho scrapbooks' and referring to 'Hymie Berg'. 16 June 1944; on his letterhead of 15a, Cocker Street, Blackpool. 12mo, 2 pp. 25 lines. Text clear and complete. Fair, on aged paper, with thin neat strip from mount along left-hand margin on reverse. The letterhead, printed in brown, is headed 'JOHN CARVETH WELLS, F.R.G.S.' and features a small caricature portrait of Wells, apparently seated in a pram, reading from a book. Beneath his name is printed 'Poems, Short Stories, Articles, Lyrics and Music. | Travelogues and Talks. Hand-made Jewellery. | Colour Linocuts. Radio Talks, Acting, Writing.' The author of this letter published an autobiography, 'My Candle at Both Ends', in 1944. Whaling at Encounter Bay. Prepared by Keith Travers Borrow [for the Hisorical Memorial Committee of the Royal Geographical Society of Australasia (S.A. 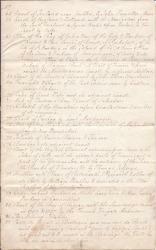 Branch) and with their permission published by the Pioneers' Association of S.A.]. 12mo, 16 pp. Stapled pamphlet. Not paginated. Good, on lightly-aged paper. Includes a three-quarter page 'Chart of the Anchorages in Encounter Bay by Wm. Light, Surveyor General'. Scarce: no copy in the British Library, and the only copy on COPAC at Oxford (where dated to 1846). 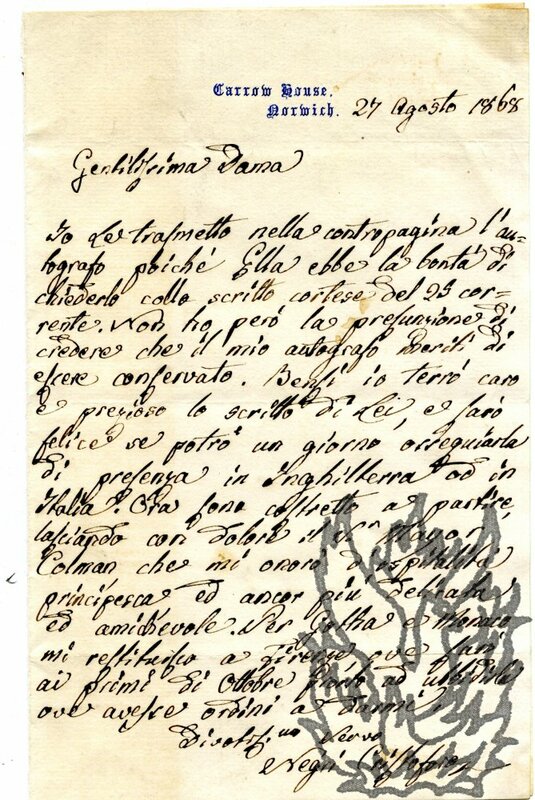 Autograph Letter Signed (twice, both 'Negri Cristoforo' ), with short poem, to an unnamed woman. 27 August 1868; on letterhead of Carrow House, Norwich. 12mo, 2 pp. Bifolium. Fair, on aged paper with a little light staining. 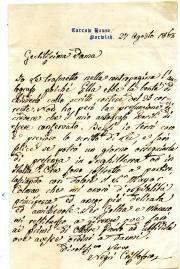 The recto carries the seventeen-line letter to a 'Gentilissima Dama', in response to a request for an autograph. On the reverse of the second leaf is a four-line poem, signed and dated by Negri, beginning 'Come un Nume che si adora'. In the letter Negri writes that he does not have 'la presunzione di credere che il mio autografo meriti di essere conservato'. All six items aged, but in reasonable condition overall. ITEM ONE: Cloth (British army?) map, roughly thirty-six inches by twenty-three wide, in colours, of 'SIAM (THAILAND) (EXTREME SOUTH) MALAYA (F.M.S.) SUMATRA (CENTRAL), with 'SIAM (THAILAND) (PART OF) SUMATRA (NORTH)' on reverse. With pin holes in corner borders (not affecting map). ITEM TWO: Dutch cloth-backed map, roughly twenty-two inches by thirty-five, in colours (Lith: G. Kolff & Co. Batavia'), for the 'Java Motor Club', of 'MIDDEN [middle] JAVA'. With a little damp staining to reverse. Typed Letter Signed to Sir Hilary Blood of the Royal Society of Arts. 31 December 1964; on his letterhead as 'MINISTER OF DEFENCE FOR THE ROYAL AIR FORCE'. Two Typed Letters Signed to the Secretary, Royal Society of Arts. 13 July 1916 and 26 May 1917; on American Geographical Society letterheads. Canadian-born American geographer (1878-1950), President of John Hopkins University, a member of the American delegation at the Dumbarton Oaks Conference, at which the United Nations was founded. Both letters docketed and bearing the Society's stamp. Both good though lightly creased and on slightly discoloured paper; letter one with a spike-hole (not affecting text) and letter two with rust stains from a paperclip.